Technical pens were the mainstay of the designer and illustrator's craft before the development of computer graphics. Now, many artists and design professionals are rediscovering the technical pen because its handiwork, in expert hands, stands out almost magically against the bland precision of computer rendered graphics. 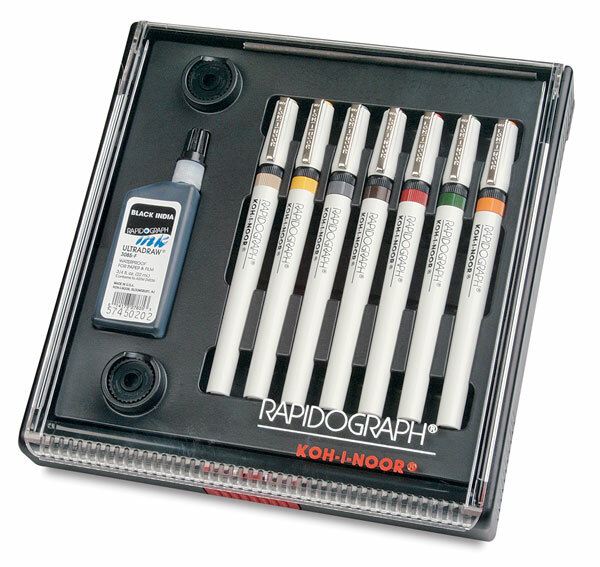 Dependability and high performance make Rapidograph technical pens the first choice among artists, designers, drafters, architects, and hobbyists. Rapidograph pens provide uninterrupted, productive drawing time. Each Rapidograph pen has a white plastic barrel with a refillable ink reservoir (pens do not come filled with ink), and a color-coded cap and point section.The double-seal cap is air-tight to keep the point from drying out. Each pen is identified by a standard point size or by its line width expressed in millimeters. (Point sizes do not correspond to points in the point/pica system of typographic measure.) Replacement point sections are available for all pens. For optimum performance, use with Koh-I-Noor Ultradraw Waterproof Ink or Trans-Mix Media Brilliant Ink. 7-Pen Slim Pack Set — Sizes 3×0, 2×0, 0, 1, 2, 3, and 4, plus a bottle of Koh-I-Noor universal ink and nib keys in a hinged-lid plastic case.